HI Guys, I wanna rebuild my original carb of my 74 pantera. Any suggestions on what the best kit would be and where they can be sourced? Mike, not sure about the re-build kit source, but having had several of the original carbs rebuilt, the biggest challenge is keeping them from weeping between the two halves. They warp over time. Even double gasketing didn't help. The mating surface may need machining, which I chose not to do. As much as I wanted to stay original, I switched to a Holley. The difference was amazing. I would never go back to original again. that's what i thought at first too, i had to change my post after i caught the Holley in the title of the thread. George or anybody else might know for sure what carb would've been supplied from DeTomaso in a 1974 Pantera prepared for sale 'we don't know' where? would it have been a Holley on a modified 4300-D manifold? De Tomaso installed 650 double pumpers (list 4777) on Euro GTS & Group 3 Panteras. 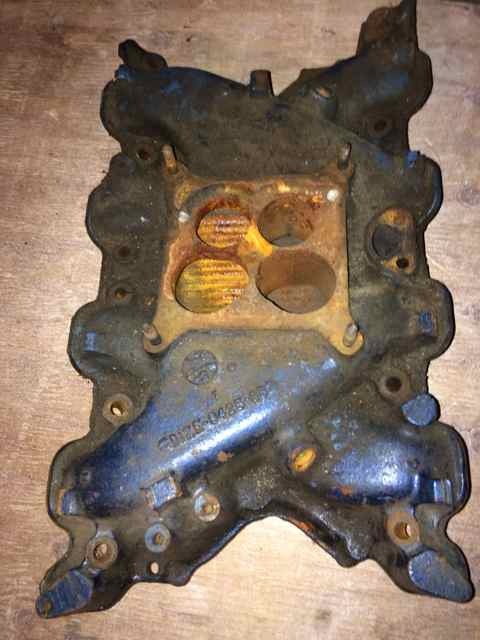 The early GTS/Gp3 which used Q code versions of the 351C actually used the spread bore manifold designed for 4300D carbs by elongating the secondary holes, as you see in 4V's picture. Chassis 6575 could be a 1974 US Pantera, or a Euro GTS/Gp3. I'm not sure what Mike West has, but the thread title makes it seem its equipped with a Holley. do you know if those Holleys installed on the Panteras by De Tomaso had Ford part numbers, and if so, what were they? Tim, this comes up roughly once a year. See post on 12 May 2016 for discussion on 'Correct carb/manifold combo'. It's difficult to research this directly since Holley as a company has been sold at least once and changed their carb numbering system at least twice since 1970 (48 years ago!) During that time they've built thousands of carb variants. FIA-legal GTS/Gr-3 Pantera club-racers were homologated with a Motorcraft 4300-D carb and could optionally use a Holley 4bbl carb #213, which crosses to a Holley 650cfm (mechanical secondary) double-pumper list #4777, along with a DeTomaso square-pattern aluminum intake manifold, as shown in the 'Gr-3 Supplemental Parts Catalogue' from DeTomaso-Europe 1972-onward. Note also the same Catalogue shows an optional Weber 48IDA two-barrel carb, 4 units to be grouped on another aluminum 'DeTomaso' intake manifold. To maximize the confusion on this subject, the FIA has changed their specs for Gr-3 several times, and loosened the requirements for legal parts used today in Vintage competition. The Holley List # 4777 is still made, though. do you mean 12 May 2017 ? Thanks for all answers and sorry for hijacking the thread, I will pose some more questions in the old thread. Hope the original poster got some useful answers.